FTL is the clear highlight of this bundle for me. As the game I've spent the most time with previously, it was the one I had to try out first. That was a mistake, as I proceeded to play far too much of it when there were other games to try and no way transfer any progress I made to the PC or iPad versions. Much has been written about the game's brilliance since its release, and with good reason. If you haven't played FTL before, it's a dream game for Star Trek fans, letting you command a starship as you explore the galaxy and evade a pursuing enemy force. It's well-suited to being played in a browser, in part because you can take a break at any time. That includes during combat, which you can pause to plan attacks or jump back over to Facebook or whatever else you're doing. Plus, with this version include the Advanced Edition expansion, you've got a game that can potentially last you a very long time. Super Hexagon is the enhanced version of what started out as a browser game known simply as Hexagon. The creation of Terry Cavanagh, developer of the fiendishly difficult VVVVVV, it's the only game I can remember playing where failure is sure to come within seconds of starting it up. The premise is simple: You move a shape around the perimeter of a hexagon, avoiding lines as they approach. Crash into one, and it's game over. It's a game that won't hold your hand and is upfront about its difficulty: the lowest option is Hard, followed by Harder and Hardest. Playing requires only two keys, and there are no power-ups or twists beyond increases in speed and variations in the way lines come in. Basic as it is, the combination of a phenomenal soundtrack and the speed that this all happens at make Super Hexagon one of the most pulse-pounding games I've ever played. I've spent a great deal of time with the iPhone version, and I continue to marvel at the simplicity of its design. Higher difficulty levels ensure you'll never lack for a challenge, and the way you can immediately restart helps to avoid frustration—as does the clever way the background music starts at varying points, lessening any sense of lost progress. Aaaaa is another game I've enjoyed in the past, but one I wasn't convinced would work well in a browser. Whereas FTL is something you can move away from at any time (provided you have any willpower) and Super Hexagon rounds are best timed in seconds, Aaaaa is the kind of visceral game that I thought would work poorly. In it, you free fall through space, racking up points by “hugging” walls while trying to make it to a designated spot as quickly as possible—hence the game's full name, AaaaaAAaaaAAAaaAAAAaAAAAA!!! for the Awesome. The browser versions of these Humble games let you play in full screen, something that is most important for playing Aaaaa, where the full effect of rushing through space is what makes it so entertaining. The game is still better when played on as large a screen as possible (ideally, on a TV through Steam's Big Picture mode), but even on a reasonably sized computer monitor, it's still a fun experience. After the stress of Aaaaa and Super Hexagon, you might be looking for something more relaxing to play. Zen Bound 2 is a fine solution as a casual, no-time-limit game where you're tasked with wrapping a finite amount of rope around various objects. It's a nice way to unwind, and it's not too terribly challenging to meet the basic goal on any given level. That said, there are optional objectives that require you to cover almost the entire object, and these can be maddeningly difficult, particularly because a mouse isn't the ideal way to play. I've spent time with the mobile version of the original Zen Bound, and touching a screen is clearly the way it's meant to be played. Holding down the mouse button and moving the mouse is how you pull the string, but the game occasionally acted as if I was holding down the button when I was not, making my attempts to reposition the mouse on my desk result in screwing up my progress. 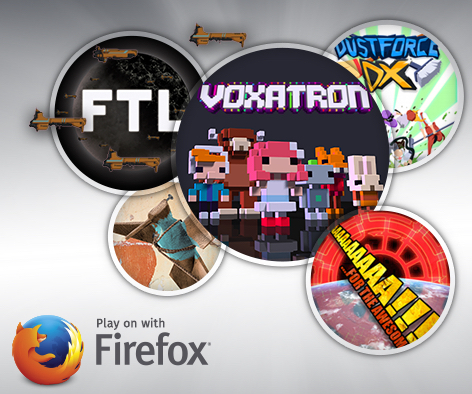 The Humble Mozilla Bundle is available through October 28, and your money can be divided up however you'd like between Humble, the game's developers, and various charities.